[prMac.com] Vancouver, Canada - InfoLogic, Inc. today is pleased to introduce MathMagic 8.0 Lite for Mac OS X, the first free app in their suite of award-winning, professional, equation editors for Mac OS X. MathMagic is the brand selected for use by thousands of large publishers and university presses around the world, and the 16 year old company offers various Pro and Personal Editions of their products, which have become a standard of the publishing industry. MathMagic Lite offers hundreds of mathematical expressions and symbols, reads LaTeX and MathML, and saves in high quality formats. The standalone app includes a streamlined interface that helps general users focus on equation writing more easily. MathMagic Lite reads various Math formats including MathML, LaTeX, Plain TeX, Wiki equations, MathJax, and MathType, just like the paid version of MathMagic Personal and MathMagic Pro. It also reads all MathMagic Personal and MathMagic Pro created equation formats such as PDF, EPS, PICT, PNG, WMF, Math Speech, and more. And MathMagic Lite for Mac can save or copy expressions in PDF, PNG, and PICT formats, so equations can be used by many other applications and documents, such as: iWork Pages, Keynote, iBooks Author, Illustrator, web design apps, and more. MathMagic Lite can read out math expressions aloud via Text-To-Speech or in a text based sentence so it is also useful for learning how to read Math expressions and symbols. Its Text-To-Speech capabilities are particularly valuable for special-needs students. Unlike the paid versions, MathMagic Lite does not support color and converts imported color text to gray. iBooks Author, Apple's recently released free application for OS X, promises to accelerate the iPad revolution in education. According to Apple, the new app allows users to easily create "beautiful Multi-Touch textbooks - and just about any other kind of book - for iPad. With galleries, video, interactive diagrams, 3D objects, and more, these books bring content to life in ways the printed page never could." MathMagic 8.0 Lite complements the ease of use offered by iBooks Author, and facilitates the creation of new textbooks that incorporate equations and scientific symbols, as well as the conversion of print textbooks for the iPad. With its superior quality and productivity, MathMagic is the choice of millions of professors, students, scientists, engineers, and school districts that rely on it for their math communication and publications. MathMagic's equation quality is unsurpassed and designed to meet stringent, high-end DTP requirements. MathMagic Pro Editions allow graphic designers to write, edit, and save equations directly in InDesign or QuarkXPress documents without going through an export/import step. "MathMagic Lite is the first completely free app we have ever offered. It is fully functional and not a trial," stated Charlie Lee of InfoLogic. "There are some minor limitations, but it provides the same professional results as our best-selling MathMagic Personal Edition. We invite everyone who ever includes equations, formulae, or mathematical expressions in their writing to download a free copy of MathMagic Lite for OS X." 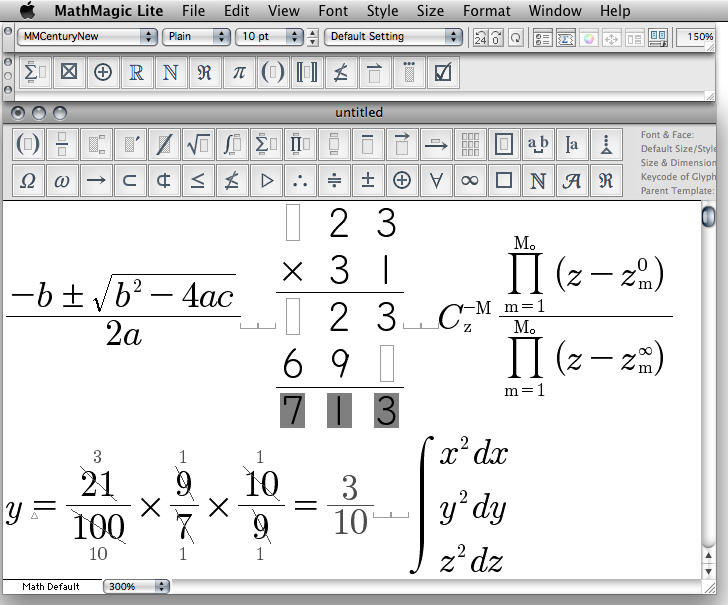 MathMagic Lite 8.0 for Mac OS X is free and available for download from the MathMagic website. Future versions of MathMagic Lite will be available free from the Mac App Store. MathMagic Lite for Android tablets and smart phones is also available free. Headquartered in Vancouver, Canada, InfoLogic, Inc. is a privately held corporation founded in 1996 by Charlie Lee. InfoLogic specializes in technical and desktop publishing (DTP), high quality digital content and Macintosh software development. Released in 1998, MathMagic is its flagship product. InfoLogic also ported ThinkFree Office to the Mac OS and released several utilities and XTensions. Its copy protection solution for fonts has been adopted by several major 2-byte font vendors in Asia. Copyright 1996-2012 InfoLogic, Inc. All Rights Reserved. MathMagic, MathMagic Pro, MathMagic Personal, MathMagic Lite, MathMagic Prime, MathMagic XTensions, MathMagic logo, and InfoLogic are trademarks or registered trademarks of InfoLogic, Inc. Other trademarks and registered trademarks may be the property of their respective owners.